Pettex Cat Litter is manufactured from pure grey fullers earth, which occurs in natural sedimentary deposits laid down millions of years ago. Often called heavyweight or grey. It is a natural clay product, said to be unrivalled in its ability to control odours, and does not need any chemical additives or scents to disguise unpleasant smells because it is a 100 per cent natural deodorizer. Every granule can hold moisture up to 125% its own weight and will react with, and neutralize ammonia. Unlike other cat litters, it is said to absorb instantly, locking in liquids and preventing them from spreading and soaking the whole tray. It also forms a solid lump when soiled and these clumps can be removed easily with a scoop, leaving clean fresh litter in the tray. 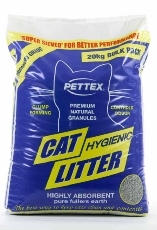 Because only the soiled litter need be removed, it makes the product extremely economical. The litter is guaranteed to be completely harmless to both animals and humans and means that it can be used with complete confidence.